Last summer, my bestie and I had a girls night and picnicked while watching an outdoor movie in the park. We both kicked ourselves for waiting until the end of the summer to finally do it, and I made a promise to myself that this summer I’d do it much more often. We live in a small apartment, so it’s not convenient to store big coolers or picnic baskets — I usually just grab a small tote and fill it up with a few essential picnic ingredients: 1) A cozy blanket — I love the Gunn & Swain Mexican blankets. 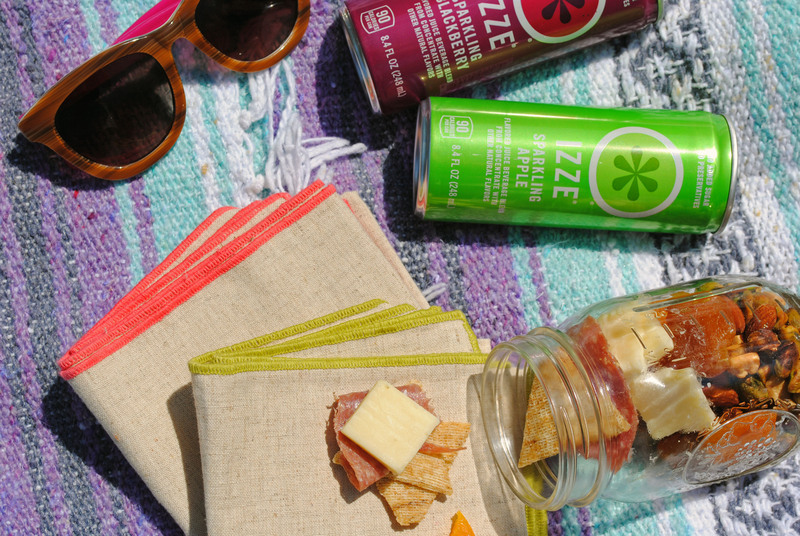 2) A few festive drinks — IZZE sparkling juices are tasty, and all you have to do is pop them open, no need to cart around glassware (but striped straws are encouraged!). 3) Snacks! I hate having to bring a knife and cutting board for a cheese plate – the less we have to carry, the better. 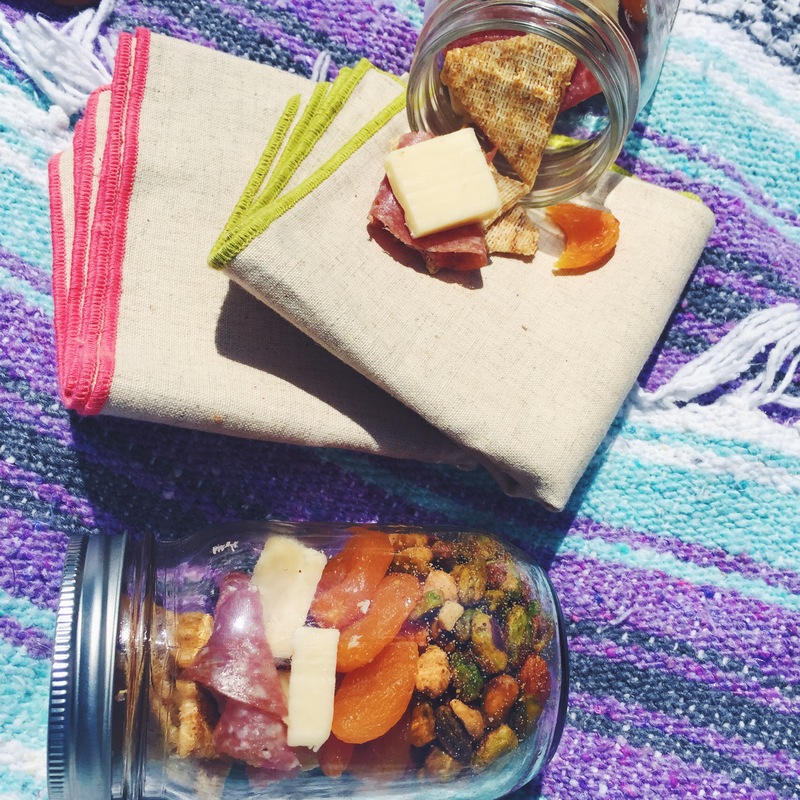 To solve for this I took a mason jar and layered ingredients to make individual cheese plate ‘kits’ — this one has mixed nuts, dried apricots, sharp cheddar, salami and crackers. 4) Bring some cloth napkins, they’re eco-friendly, and since they’re a bit heavier than a paper napkin they won’t fly away. 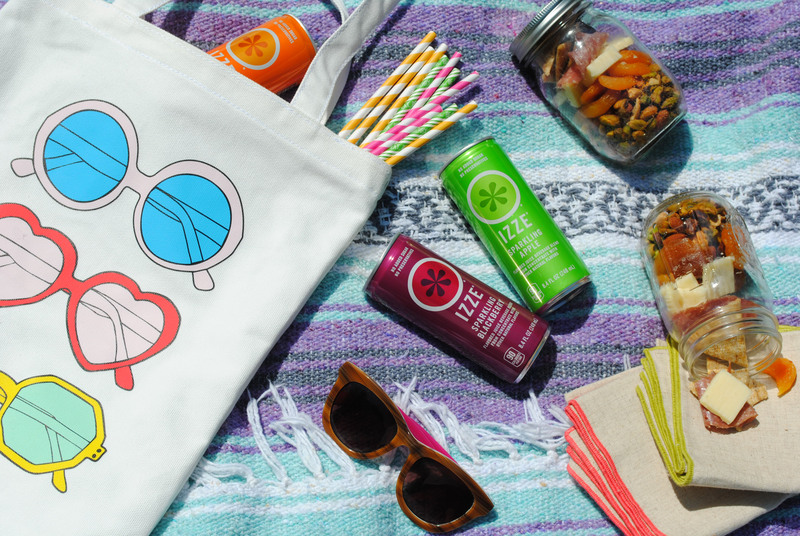 Throw it all in a fun tote, grab your sunnies and girlfriends, and you’re ready for a day in the park! Please Note: This post was sponsored by Izze; all images, ideas and content are my own. 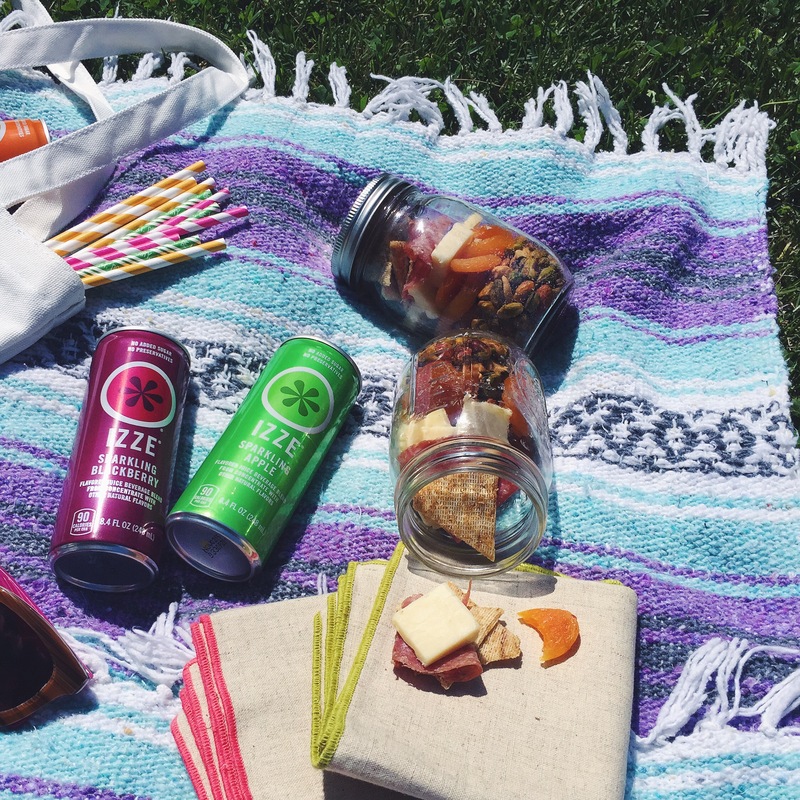 I just want to drink Izze sodas and sleep on a blanket under the sun ALL DAY! Would you mind sharing where you got those awesome cocktail napkins? Davey — they’re from anthropologie! 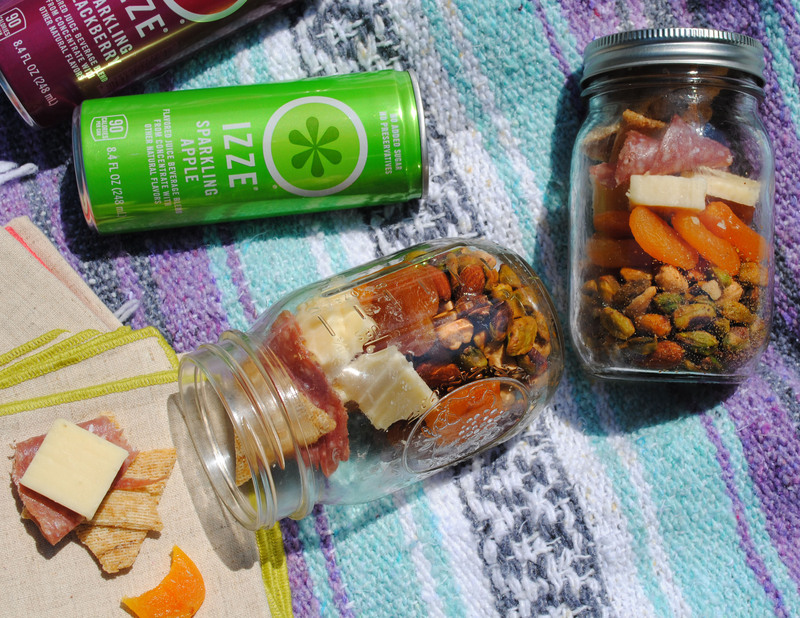 Love the mason jar snack idea – inventive. Do the crackers get soggy though? Thinking I’d might pack separately. I may also use these ideas but with “tupperware” I tend to break the glass stuff! I absolutely love everything about this post!!! Never thought to make my own charcuterie in a jar. And I’m definitely buying that bag. Your style is spot on. Of course! Love your blankets! The napkins are from Anthropologie! #Domestikatetravels Tips For Planning An Awesome Vacation. Veggie Dip Bowls with Alouette. This blog contains contextual affiliate marketing links and I may receive commission on sales of some products linked in posts; the content is never influenced by an affiliate partnership.